Subtitle: Satan’s final deception for mankind could not have been possible were it not for his successful invasion of the Charismatic Church with actual White Magic Witchcraft, dressed up to look like Christianity, of course. The world is about to see the ultimate lie from Satan and his cohorts of world deception. An unholy trinity, with the devil posing as God, along with his false christ and false spiritual anointing, will produce a master lie, a lie so captivating and breathtaking that the very elect will reel with astonishment. This final lie must be the grandest thing that Satan has ever created. It will be his masterpiece of all time and eternity. Apostle Paul spoke of this lie as he warned us about the coming “mystery of iniquity”. Along with describing this ultimate evil, he spoke of the “Restrainer” and His being “set aside” before this lie could materialize to its coming height. Read Paul’s words carefully. “And now you know what is restraining him from being revealed at this time; it is so that he may be manifested (revealed) in his own appointed time. For the mystery of lawlessness (that hidden principle of rebellion against constituted authority) is already at work in the world, but it is restrained only until he who restrains is taken out of the way. And then the lawless one (the antichrist) will be revealed and the Lord Jesus will slay him with the breath of His mouth and bring him to an end by His appearing at His coming. The coming [of the lawless one, the antichrist] is through the activity and working of Satan and will be attended by great power and with all sorts of [pretended] miracles and signs and delusive marvels–[all of them] lying wonders– And by unlimited seduction to evil and with all wicked deception for those who are perishing (going to perdition) because they did not welcome the Truth but refused to love it that they might be saved.” (2 Thessalonians 2:6-11). It’s very important that we understand the master of this lie. Antichrist is called the “mystery of iniquity“, but it is clearly stated that his “coming is after the working of Satan.”; he is a design of Satan in the similar sense that the Messiah or Christ was the “begotten of God.” In other words, Satan is about to produce a “false Christ” (Matthew 24:24) by using his “false anointing” resulting in the “greatest lie in human history.” Satan is an imitator and this will be his final imitation. A masquerading god, with a masquerading Christ accompanied by a masquerading False Prophet, will mesmerize the world. Satan’s masquerading of this final lie will be accompanied with incredible miracles. The apostle stated that his coming will be “with all power and signs and lying wonders”. Satan is a powerful creature, second only to God Himself and he can produce paranormal happenings that will totally convince the unsuspecting. Notice that Paul called his activities, “lying wonders”. This clearly describes all the so-called miracles of Satan; they are not supernatural, but paranormal. God alone is supernatural (above or beyond nature. . . miraculous, spiritual – Chambers English Dictionary, W&R Chambers, Ltd, Edinburgh, 1990, p. 1474. ), but Satan can only produce a paranormal (abnormal psychologically, not susceptible to normal explanation – Chambers English Dictionary, W & ft Chambers, LTD, Edinburgh, 1990, p. 1047.). Satan’s activities are nothing but clever tricks and masquerading lies that deceive. They appear to be supernatural, but under close scrutiny they are nothing but hidden lies. Yes, they will have the look of being supernatural, but they are distortions of reality. Let us examine the incredible Satanic “lying wonders” planned to immediately precede the appearance of Antichrist. Minutes before Antichrist arises, some seemingly supernatural sound will be heard, and spiritually felt, by everyone on the planet, simultaneously. At no other moment in world history will so many people be so devastatingly impacted at the same moment! This powerful sound is designed to get people looking outward and upward — even running out of office buildings to look skyward — to see what caused that heart-felt, soul-jarring sound. Images of Antichrist will appear all over the world simultaneously, speaking to each ethnic group in their own language. The true “Signs and Wonders” will have begun, and will be terribly impactful, leading many precious souls directly into Hell. When this physical – spiritual “sound” hits, people’s souls will literally shake like a bowl of jelly. The Bible says that God is going to shake everything that can be shaken, so that those things which cannot be shaken will remain [Haggai 2:6, 21; Joel 3:16; Isaiah 13:13]. Too many Christians today are taking for granted that they will stand before the onslaught of the time of judgment when Antichrist shall finally arise. Too many Christians are so nonchalant about the appearance of Antichrist, that they may not be spiritually ready for the unbelievable, unprecedented soul-jarring experience. If you are not truly Biblically saved, if you are not righteous in Jesus’ Righteousness, and if you are not keeping a “short list” of daily sins committed, you may not be as protected against this unbelievable soul-jarring experience as you might believe. This is not the moment in world history to be a lukewarm, or “carnal” Christian! Make no mistake about this fact: the very arising of Antichrist is God’s Judgment, the beginning of His most fearsome and furious judgments. “And for this cause God shall send them strong delusion, that they should believe a lie”. (2 Thessalonians 2:11). This lie” is a definite article or “THE Lie” by which he deceives the world. It is the ultimate lie. While Satan is the ‘Father of Lies” and every untruth originates with him, this lie is more. Satan is masterminding an unprecedented master lie that will continue to grow and escalate until it replaces the God of the Bible. It will also replace all dependency on absolute Biblical truth as we now know it with a new occult theology. Jesus Christ will be preached and presented as the same historical Jesus of church history, but with a “new paradigm” of understanding. The working of the Holy Spirit will undergo such a radical reinterpretation that there will be only vague similarity. 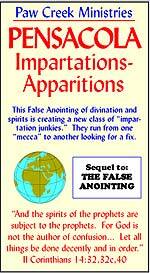 I believe the false spiritual anointing now being manifested all around the world is the first step in producing this “final lie.” When you look closely at this false spiritual anointing permeating Charismatic Churches, it becomes abundantly clear that it is nothing but White Magic dressed up in a “christian” garb. All throughout Scripture, Satan is seen using white magic, i.e., using his power for the “benefit” of mankind. This has been a clever trick or deceptive tactic of the enemy of righteousness. Satan hides behind the difference between black magic and white magic. In producing both expressions of his dark nature, much of the world never sees his presence in the many expressions of White Magic. As has been often said, “White magic is the beautiful side of evil” A witch will argue you to the end that her white magic has nothing to do with Satan — she serves Lucifer, she insists! The truth is that White Magic is only beautiful to those who are deceived; unfortunately, these deceived will never realize this side of the White Throne Judgment Seat that they were serving Satan all along. Look at the effort of Satan to deceive Jesus Christ during His forty days of fasting. “Then the devil taketh him up into the holy city, and setteth him on a pinnacle of the temple, And saith unto him, If thou be the Son of God, cost thyself down. For it is written. He shall give his angels charge concerning thee: and in [their] hands they shall bear thee up, lest at any time thou dash thy fool against a stone. Jesus said unto him, It is written again, Thou shalt not tempt the Lord thy God. Again, the devil taketh him up into an exceeding high mountain, and sheweth him all the kingdoms of the world, and the glory of them; And saith unto him, All these things will I give thee, if thou wilt fall down and worship me. Then saith Jesus unto him, Get thee hence, Satan: for it is written, Thou shalt worship the Lord thy God, and him only shalt thou serve. Then the devil leaveth him, and, behold, angels came and ministered unto him’ (Matthew 4:5-11). The Scripture then affirms that He was in the wilderness all forty days (Mark 1:12-13), that the devil left him in the wilderness when the temptation was finished (Matthew 4:11), and that Jesus returned from the wilderness in the power of the Spirit (Luke 4:14). Yes, Satan had tempted Jesus from the pinnacle of the temple and from an exceeding high mountain during those same forty days. There can be little argument that the devil used his only paranormal powers (White Magic) to endeavor in this defeated effort to deceive the Son of God; how else could he show Jesus the kingdoms of the world to promise them to Him if He would only worship Satan? Philip, the evangelist, faced off with White Magic in the eighth chapter of the Book of Acts, Simon the sorcerer was apparently experiencing a revival of religion in this city of Samaria, The writer Luke tells us all about Simon. His reputation in the city was, “This man is the great power of God.” Does that not sound strikingly familiar to our present host of new Charismatics? The Old Testament has many examples of different expressions of White Magic. Moses met these powers head-on as he dealt with Pharaoh of Egypt. The sorcerers of Pharaoh’s court could produce serpents with their enchantments. “Then Pharaoh also called the wise men and the sorcerers: now the magicians of Egypt, they also did in like manner with their enchantments. 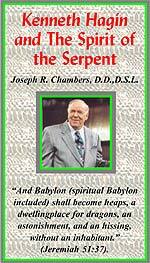 For they cast down every man his rod and they became serpents: but Aaron’s rod swallowed up their rods.” (Exodus 7:11-12). In every case, the truth of God’s supernatural power was quick to judge and consume the devil’s substitute. All God needed was His man full of His Omnipotent Holy Spirit power to carry out the deed of judgment upon the White Magic practitioner. The two sons of Aaron tried their skill in using White Magic in the tabernacle of Israel almost as soon as God had established the priesthood. “And Nadab and Abihu, the sons of Aaron, each took his censer and put fire in it, and put incense on it, and offered strange and unholy fire before the Lord, as He had not commanded them. And there came forth fire from before the Lord and killed them, and they died before the Lord. Then Moses said to Aaron, This is what the Lord meant when He said, I [and My will, not their own] will be acknowledged as hallowed by those who come near Me, and before all the people I will be honored. And Aaron said nothing. Moses called Mishael and Elzaphan, sons of Uzziel uncle of Aaron, and said to them, Come near, carry your brethren from before the sanctuary out of the camp. So they drew near and carried them in their undertunics [stripped of their priestly vestments] out of the camp, as Moses had said. And Moses said to Aaron and Eleazar and Ithamar, his sons [the father and brothers of the two priests whom God had slain for offering false fire], Do not uncover your heads or let your hair go loose or tear your clothes, lest you die also and lest God’s wrath should come upon all the congregation; but let your brethren, the whole house of Israel, bewail the burning which the Lord has kindled. And you shall not go out from the door of the Tent of Meeting, lest you die, for the Lord’s anointing oil is upon you. And they did according to Moses’ word. (Leviticus 10:1-7; Parallel Bible, KJV/Amplified Bible Commentary). The very idea that Aaron’s sons — two of God’s anointed priests — would use Satan’s substitute before the altar of God Jehovah was grievous blasphemy and was met with God’s immediate deadly judgment. Fire from the Lord devoured them. Moses would not allow their father, Aaron, or their brothers to grieve over their death. They could not even leave the Tabernacle of God to attend the burial. My friends, it is a serious thing to call White Magic the work of the Holy Spirit! 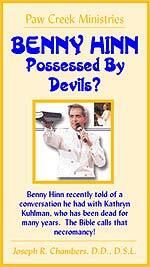 When you see Kenneth Hagin, Kenneth Copeland, and Benny Hinn performing with occult power and teaching occult doctrine, in the guise of Christianity, you can see the ultimate danger in which they are placing their very souls! It’s overwhelmingly grievous to realize that Satan can transform himself and his ministers into powerful persons of remarkable charisma. We are not dealing with a back room filled with smoke, a witch’s brew, or some slight of hand magician. Black magic has always been an ugly thing that Satan used to paint a picture of how he wanted himself conceived. Then, he masquerades with his ‘beautiful” side so he can deceive and then damn the multitudes. White Magic has many forms, but false religion has always been its main expression. From Cain, the son of Adam and Eve, and Nimrod, the grandson of Noah, you can trace a line of White Magic straight to the New Age of our modern world. We must now realize that paganism has gone mainstream in our Western Society. Satan’s “final lie” must take the “beautiful side of evil”, combine it with all the depths of its magical powers and then transform them into the theology of Apostate Protestant churches. Catholicism did this very thing during the early days of the third and fourth century. They are still teaching these doctrines of mixture. That’s why they can claim “miracles” by the thousands, apparitions of dead “saints”, holy water that supposedly chases away evil spirits, wafers “bleeding” with the very blood of Jesus, crying statues, etc. This same pagan spirit has invaded the Charismatic and Apostate Evangelical world. Satan also set in place the worship of pagan goddesses that are equal in scope and powers to the Catholic Virgin Mary. The Dalai Lama bluntly told New Age author, China Galland, that the same spirit of “rangyung” who was producing the Madonna apparitions and miracles in America and Europe with the Virgin Mary was also producing the Madonna goddess miracles in China, Tibet, and India with the Hindu and Buddhist goddesses. Doubt it not! The same demonic spirit that regularly produces these occult “miracles” in India and China is producing these “miracles” in the lands dominated by Roman Catholicism. White Magic is the power behind all these manifestations, and is setting up the peoples of the world for the final deception, the appearance of Antichrist. Apostle Paul warned of this invasion of magic. Notice clearly what the apostle warned us about. He said that Satan could transform himself to an angel of light. That word “transform” is a derivative of a powerful word, metarnorphoo. These two Greek words mean basically the same, except that metamorphoo is positive, while this same word in the Greek, metasehematizo, is negative. In the first word, as Apostle Paul used to describe being “born again and sanctified’ by the blood (Romans 12:1-2) it is a beautiful transformation. In this second word it is a transformation also, but for the purpose of disguising to deceive and change. Satan transforms himself by his magical powers to deceive and change mankind. He likewise transforms his ministers. Read 2 Corinthians 11:13-15 again, meditatively. This fresh revelation to my heart changed the way I now understand “the final lie.” These ministers are actually transformed by magical powers and a confusion of reality into counterfeit “ministers of righteousness.” Steve Hill at Brownsville Assembly preaches almost every night on a counterfeit repentance of some description. Magical powers would be soundly rejected by most Pentecostals and Evangelicals unless they were clothed over with an apparent facade of “righteousness.” There were very few churches that followed alter the manifestations at Toronto until Toronto was sanitized by this “transformation” of Pensacola. Now, Pensacola has legitimized the white magic of Toronto by giving it an appearance of righteousness. “And such as violate the covenant he shall pervert and seduce with flatteries, but the people who know their God shall prove themselves strong and shall stand firm and do exploits for God.” (Daniel 11:32; Parallel Bible, KJV/Amplified Bible Commentary). The first step in spiritual deception is the light and careless treatment of God’s true covenant, the Holy Scripture. No one can be deceived until they take the Word of God lightly and handles it carelessly; this generation has fallen headlong into the new versions of a corrupted covenant. Now, Satan can do his intended work. He flatters them with his and his servant’s smooth words. This word “flattery” is a feminine form of smooth talk. It is actually a sensuous deception. In the Book of Revelation, John spoke of this very same spirit as the spirit of Jezebel. In NEWS1841, we quote Paul and Jan Crouch, Kenneth Copeland and others as they speak the most blasphemous things imaginable about Jesus and His Holy Word; why, anyone who had even a minor amount of Scriptural knowledge would immediately get up out of their chair and walk out of the auditorium, or, if they are viewing this charade at home, would immediately turn the TV set off. But, no, these blasphemous people are applauded, admired as men of God, and are given money galore so they can build their palatial estates, their “Heaven on Earth”. These blasphemies are clearly the work of Satan’s End of the Age deceptions. We are not fighting White Magic alone, but a sensuous form of White Magic. Sensuality in religious worship is how Nimrod made pagan religions so very captivating. Nimrod included in the temple worship: singers, dancers, and art forms to titillate the crowd with cross and/or sensuous dressing participants. The singing in most churches today has become the highest form of entertainment. Men and women alike dress to the fine points of showbiz excellence. The entire church world is being trivialized with singing that is appeals more to the eye, the body and the flesh than to God. Religious rock music has also taken on a form of flesh and sensuousness that has absolutely no kin to Biblical worship. When you mix paranormal powers with slick entertainment, sensuous music that has a love song flavor and ministers that have been transformed into counterfeit “ministers of righteousness,” you have the making of a powerful movement We are still in the early stages of this development. White Magic has always been the favorite means of Satan’s deception and he is preparing a lie so incredible and so convincing that multitudes will be destroyed in their faith. Our modern technologies of communication have trained our current generation to respond to surface perceptions, clichés and glitzy presentation. It is the perfect vehicle for evil powers to use to present the false spiritual anointing and its white magic fanfare. When you add paranormal (Satan’s supernatural) activities to a fleshly display, watered down, twisted theology, and promotion by the biggest names in religious circles, you’ve got the power to convince a multitude! As these poor, deluded souls shown on these various “Signs and Wonders” videos “take pleasure” in participating in the unrighteousness inherent in the White Magic they are practicing, if they continue such practice, God will send them a “strong delusion” to believe the lie of Antichrist so completely they can never see the truth to be saved! Resist the temptation to get mad at us for simply telling the truth; instead, open your spiritual eyes and hearts to this truth, so you may turn to be eternally saved. What can I say, except that we have now entered the prophesied time of deception unparalleled in church history. 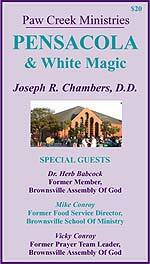 We will certainly continue to report to you this exploding revival of white magic in the church. We believe it is the outpouring of Satan’s “Final Lie”. We will only see the first stages until the Rapture of the Bride and the removal of the “Restrainer.” Our text for this article made it clear that the ultimate expression of the “mystery of iniquity cannot be revealed until the “Restrainer is taken out of the way.” (2 Thessalonians 2:6-7). We must not allow this great Truth to blind us to deception that may well proceed the Rapture. We must prepare ourselves and every soul that will listen as we await His supernatural return. It will grow worse and worse and darker and darker. The infallible Word of God, unspoiled by false human interpretations — obeyed and loved — is our anchor of the soul. Be careful that your “anchor holds and grips the Solid Rock” (Jesus Christ). This great deception truly is a firm sign that we are in the End of the Age.